* Fuel-injected, liquid-cooled, four-valve-per-cylinder engine boasts forged pistons, carburized connecting rods, and ceramic-composite plated cylinders. 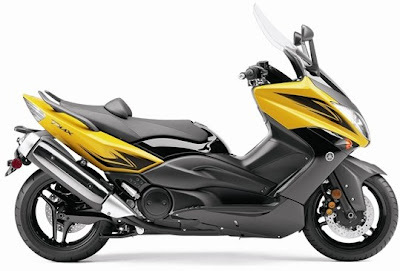 The TMAX has a 11.0:1 compression ratio; upswept muffler canister; CF die-cast aluminum frame; 43mm front forks; 4-piston mono-block caliper dual front disc brakes; rear disc brake; aluminum die cast wheels with radial H-rated tires; fully featured multifunction instrumentation with speedometer and tachometer; and radical new sports styling; with those credentials, it’s no wonder TMAX is the Super Sport Scooter. * Horizontally positioned 499cc parallel twin, with reciprocating balancer, offers plenty of smooth power, enough for two-up touring at highway speeds. Configuration helps keep weight low in frame for mass centralization. 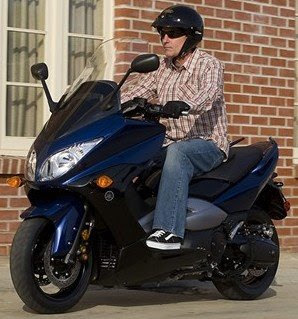 * Luxury scooter appointments include a double glove box in the streamlined front apron, a position-adjustable operator backrest, a storage box under the seat spacious enough for a large full-face helmet, and the excellent wind and weather protection that comes from the TMAX’s floorboard/ apron/windshield configuration. * Continuously variable transmission connects engine power to the wet multiplate centrifugal clutch via a durable double-cog-type rubber V-belt. Silent chain efficiently transfers power to the rear wheel. This proven system, combined with TMAX’s ample power, gives a whole new meaning—and adrenaline level—to twist-and-go throttle operation. 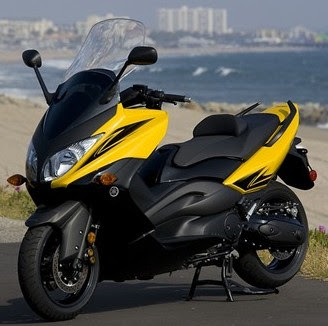 * The TMAX achieves fuel economy up to an estimated 47 mpg** with a fuel tank that holds 4 gallons of gas. * DOHC, four-valve-per-cylinder, 499cc parallel twin, liquid-cooled engine is horizontally mounted and performance engineered with forged pistons, carburized connecting rods and ceramic composite plated cylinders for plenty of tractable power. Also includes a horizontally opposed reciprocating balancer for uncommon smoothness. * Lubrication is via a semi-dry-sump system with an oil cooler for longer engine life. * Continuously variable transmission connects engine power to the wet multiplate centrifugal clutch via a durable double-cog-type rubber V-belt. Pivot coaxial drive shaft is used, allowing use of a swingarm separate from the powerplant for excellent handling. Two-stage, adjustment-free silent chain system then transfers power to the rear wheel. * Muffler incorporates exhaust catalyst technology to reduce air pollution. * Fuel tank emission system includes a charcoal canister to control gasoline evaporation and reduce air pollution. 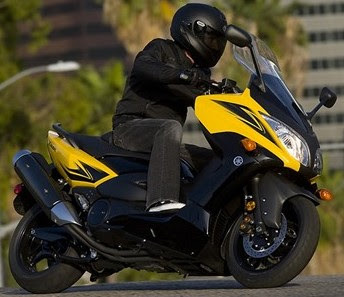 * Using technology proven in Yamaha’s sportbike line, TMAX has a lightweight, CF die-cast aluminum frame that provides rigidity and balance for superb handling. * Motorcycle-type telescopic front forks use beefy 43mm tubes. * 15-inch cast aluminum wheels front and rear are fitted with radial tires for excellent, sporty handling. * Front double disk brakes with four-pod mono block calipers. * Pin-slide, one pod rear brake caliper with parking brake system. * Brake lever is adjustable for operator comfort. * Rear seat is hinged for easy opening. Underseat storage is spacious enough to store a large full-face helmet. * Electronic fuel-injection system provides sure starts and excellent performance in virtually all conditions and altitudes. 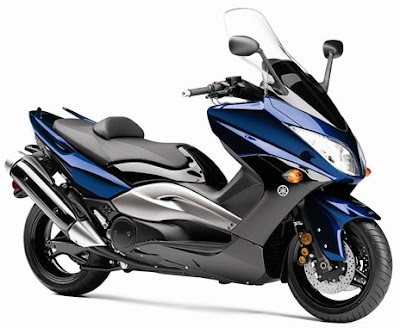 * Bright, headlights and taillight take their styling cues from Yamaha sportbikes. Nice post! You have worked hard on jotting down the essential information.